For many years I have enjoyed history, politics and studying leadership. 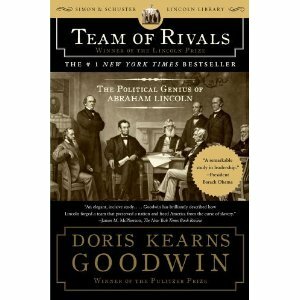 “Team of Rivals The Political Genius of Abraham Lincoln,” by Doris Kearns Goodwin allowed me to enjoy all of these in one book. Team of Rivals goes far beyond just a biography of events, but delves deep into the character of Lincoln. When Lincoln began to form his Cabinet team he did not take the normal route of patronage. He had two political goals in mind. First to unite the moderate and radical factions of the Republican Party and second to select the person who had the best skills to fulfill the specific Cabinet role. With the ability to meet these two goals he was able to accomplish his two Presidential goals, reunite the nation and end slavery. The people he found were his rivals for the Republican nomination. He built a team who often disliked each other, and still had their own agendas. But Lincoln found away to bring them together as a team and successfully accomplish all four goals. Lincoln was a very skillful and shrewd politician, but he stayed true to his beliefs and passion for our great country. Willingness to take responsibility. Even when one of his Cabinet members made an error, or even went against Lincoln’s wishes, he would step up and take full responsibility without calling out the person in error. He was not concerned with who received credit. Lincoln could see beyond the current actions of his Cabinet members and his Union Generals and see their potential. Lincoln was long suffering. Because he could see the true potential of others, he gave them multiple chances to rise to the occasion. Only after many failed attempts would he remove someone who was not performing well. Lincoln stayed true to his values and principles to reunite the country and slavery. When the bloody war was finally over he worked to welcome the South back into the Union without holding a grudge, or seeking revenge or punishment. Goodwin also includes a lot of personal information that shows Lincoln as a master story teller, devoted husband and father. He would often use his stories to diffuse deep political tension, and drive home his point. To me the book was a bit long (over 700 pages). Almost the 1st half of the book is a mini-biography of Lincoln and each of his primary Cabinet members. It is not until page 329 that you get to Lincoln’s inauguration. This a great book for any fan of Lincoln, history or politics. It is also a great guide on leadership based on values and principles held by Abraham Lincoln who lived it out during the greatest crisis of our nation. What other leadership qualities to do you believe Lincoln demonstrated? What other historical leaders do you believe are great examples of leadership? If you have read Team of Rivals what are your thoughts on the book?